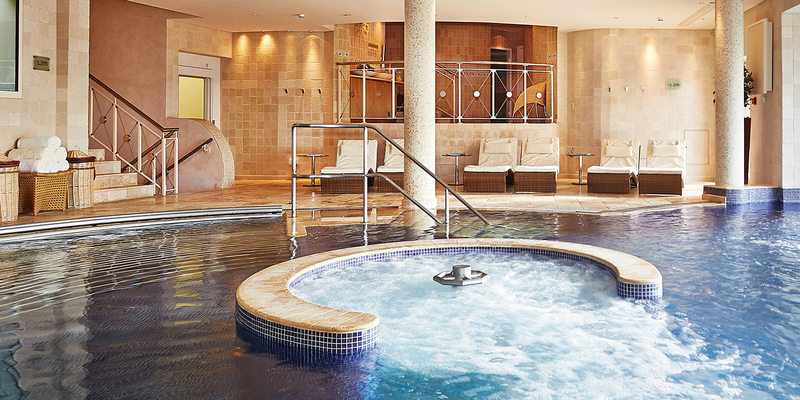 Tucked away at the bottom of a long driveway, the peaceful Aquarias Spa at Whatley Manor oozes charm and exclusivity. The cool, calm spa feels intimate and personal with a wide range of treatments delivered by capable therapists. It also has a Natura Bissé Bubble Suite. Drift in the large hydropool, heat up in the thermal experiences including a tepidarium, calidarium, steam grotto and sauna, or swim outside to the bubbly outdoor pool and watch the wildlife. Whatley Manor is a rambling honey-hued Cotswold manor house in 12 acres of sweeping grounds dotted with streams and ancient oak trees. Drive down the long approach road and huge, arched oak doors open, as if by magic. A member of staff will be waiting to greet you and handle your luggage. 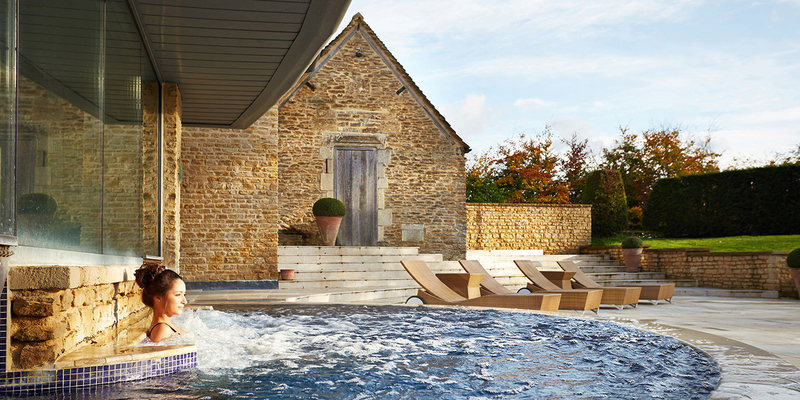 Cotswold charm gently merges into holistic wellness in the modern Aquarias Spa, which is housed in a sympathetic extension to the hotel. There are two entrances to the spa: through an old courtyard with buttery stone facades and preserved stable doors, or within the hotel itself. (You are encouraged to wander from your room to the spa in your robes.) The spa is set over two levels and is surprisingly sprawling, with five treatment rooms and a double treatment suite including a couples' hydro-bath. The reception is very calm with pale wood floors, exposed brickwork and skylights letting the sun stream in. A friendly receptionist greeted us and showed us around the spa. The changing rooms are equally peaceful with stone-tiled floors, honey-coloured lockers and bright red seating. There's a mirrored vanity bar stocked with hand and body lotion, facial cleanser and Dyson hairdryers, a private changing room, a line of frosted glass-fronted showers with shampoo, conditioner and body wash, and a loo. Everything was immaculate during our visit. 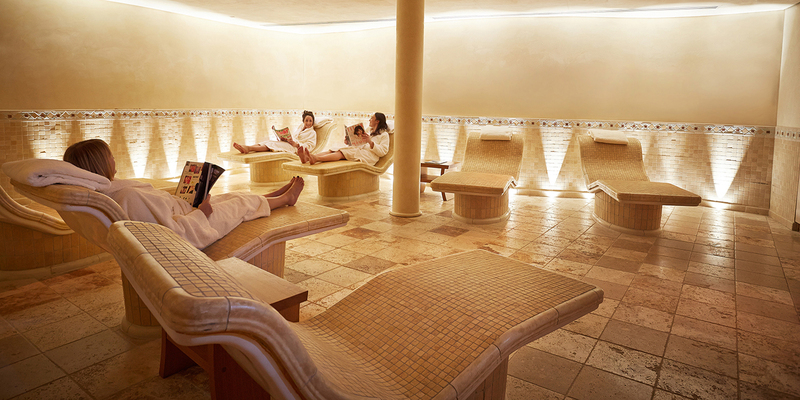 Aquarias Spa has a thermal journey that you can follow, or pick and choose your favourite heat experiences. We started at the salt showers, using the scrub to freshen our skin. We moved on to the gently warmed caldarium with ylang yalng and lime-blossom scent. The hotter laconium was deliciously scented with orange and mandarin. The toasty steam grotto was fresh and minty, and we finished in the hot traditional wooden sauna. Cool down under a rain-like deluge in the experience showers. 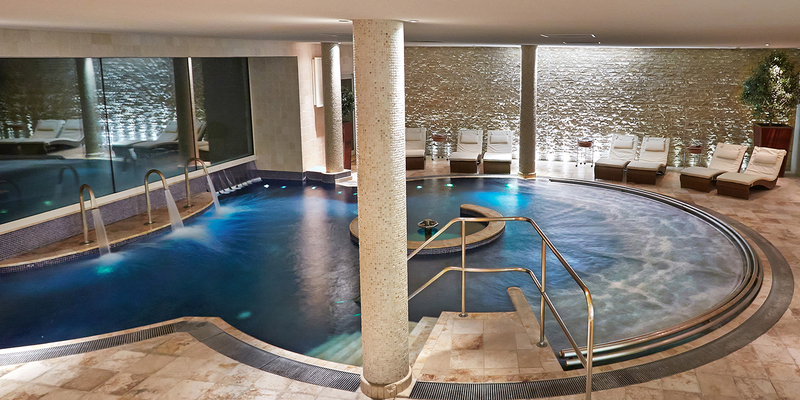 The heart of the spa is the large hydrotherapy pool which runs from the inside to out. We loved lying on a submerged lounger, feeling the bubble jets working away, and having our shoulders pummelled under the swan-neck fountains. At one end, floor-to-ceiling windows overlook the gardens. Swim though a little opening to the outside Jacuzzi-style seats looking over the spa terrace. There are plenty of loungers inside and out where you can cosy up in a robe and bury your head in the latest magazines. Aquarias Spa has two relaxation rooms. The wave dream sensory room features a rainbow of lights creating hypnotic patterns on the walls. 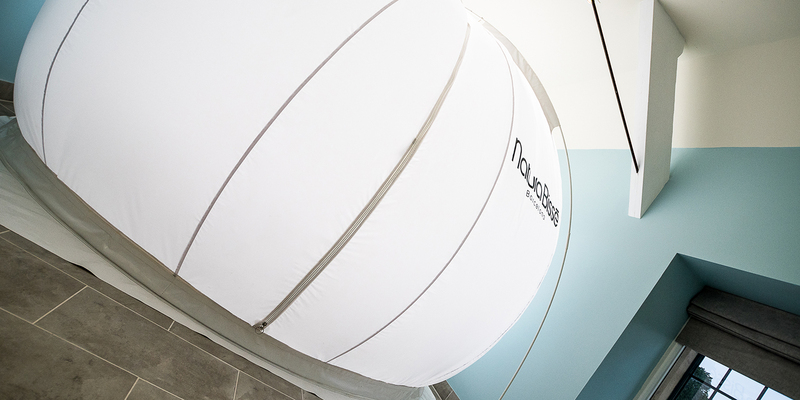 The huge bean bags adjust to your body; grab a blanket and drift off post-treatment listening to the sounds of the amazon rainforest. 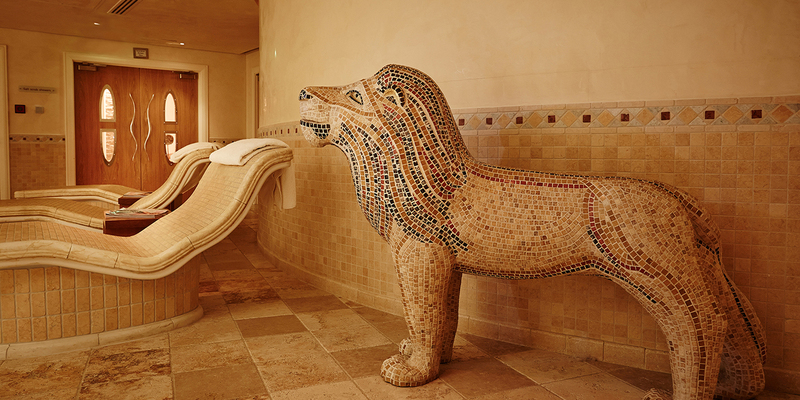 The spacious tepidarium has ten heated mosaic recliners, stacks of magazines, and a mosaic lion to greet you at the door. Aquarias Spa also has a manicure and pedicure suite with views of the gardens, and a well equipped gym. We tried the Natura Bissé Vitamin C + facial (60 minutes, £95) and Citrus Scrub (30 minutes, £55). I disrobed and lay on my front, inhaling a Vitamin-C spray deeply: imagine a vat of Seville oranges. Bandara scrubbed the back of my body and limbs, then turned to the front. With a clever arrangement of towels, we managed to maintain my modesty. He left me to shower, and I was surprised how easily the scrub came off, leaving my skin glowing and gleaming with a citrusy zing. It smelled wonderful. I lay back down and Bandara returned, first applying lotion to my body, then getting me comfortable for the facial. After cleansing my skin, he applied an exfoliator, which he removed with warm mitts. His technique with the facial massage was thorough, ironing out wrinkles and frown-lines, and massaging around my mouth. He delicately painted on a mask which he warned might tingle but felt pleasantly warm. As it set, Bandara gave me a very soothing head massage, then removed the mask with warm towels. After a spritz of orange scented mist, he applied serum and moisturiser, and ended by gently pressing my "third eye". He left me to relax then brought me some green tea and advised me to leave the products on for as long as possible. He didn't have to persuade me: I loved the smell and feel of the Vitamin C + range and my skin clearly benefited from drinking it all in. The facial left me looking radiant and shaved off a few years. 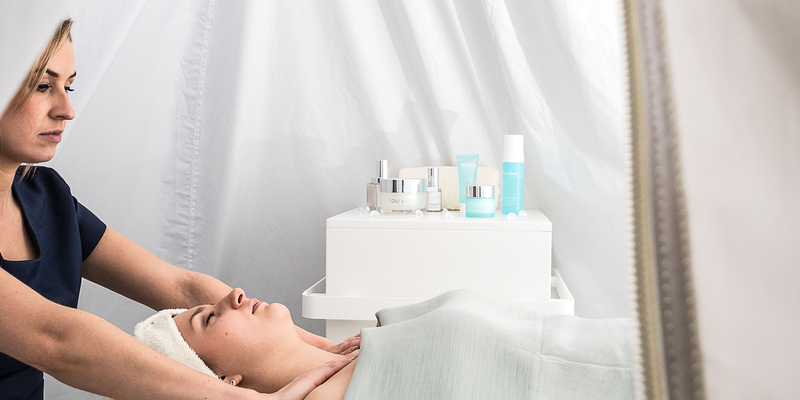 Aquarias Spa offers a range of facials, massages, detoxifying and restoring body wraps and scrubs using Natura Bissé or ila products. Men and mums-to-be are well catered for, too. If you're feeling especially indulgent, book the VIP suite and enjoy a two- or three-hour ritual. The light and airy spa lounge overlooks the pool and offers sandwiches, soups, salads, a huge range of teas and freshly-made smoothies. (Our smoothie of the day was beetroot, ginger, blueberry and pineapple: amazing.) All the produce is locally sourced; think Coln Valley smoked salmon, and Wiltshire beef. We chose a grilled halloumi salad that was fresh and flavoursome. You can also have cream teas, traditional or Wiltshire, with or without bubbles. In the evening, we ate in the newly refurbished Grey's Brasserie, where traditional food is given and fun -- and delicious -- creative twist. Our sea bass with tomato jus was a revelation. The hydrotherapy pool: Overlooking the curving hills, the indoor/outdoor pool is a real highlight. We also loved draping ourselves on the four-poster cabana bed sipping iced tea brought to us by a spa butler. The spa atmosphere: Aquarias Spa is seriously serene and the scents around the spa are a treat for the senses. The thoughtful extras: These include therapists bringing around iced tea for guests; the basket of sanitary products in the changing rooms; flannels cooled in a bowl of crushed ice by the heat facilities. The food: We could wax lyrical until the last petal falls. The lack of a swimming pool: The hydro-pool is lovely, but not large enough to swim. Aquarias Spa is a wonderful choice for couples, solo spa goers and small groups of friends in search of a tranquil spa day. Foodies will love the cuisine from the healthiest option in the spa to the most decadent tasting menu. 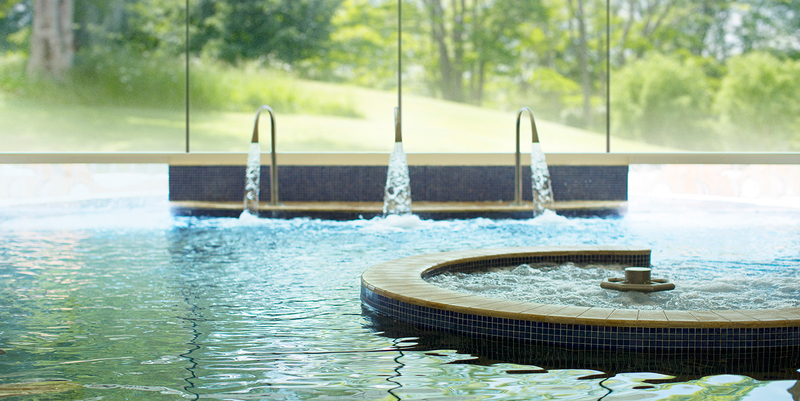 We awarded Aquarias Spa at Whatley Manor a Good Spa Guide Bubble rating of 5 Bubbles. The delectable food, great thermal facilities, large hydrotherapy pool, and indulgent treatments make it fit for a Queen (or King). There are two restaurants to choose between; The Dining Room and Grey’s Brasserie both of which are overseen by executive chef Niall Keating. The cuisine focuses on a mix of modern British comfort food using seasonal and local ingredients whenever possible . With two bars on offer there's no shortage of places for an aperitif either! There are fifteen rooms and eight suites available in this Cotswold manor house. Each room is individually designed and styled with a modern take on traditional country decor making the rooms both stylish and homely. From standard rooms to an impressive grand suite there's a room to suit every type of getaway at Whatley Manor.